The captivating story of an infant’s tragic death and a mother’s despair is told through dactylic fragments in A Cloth House. In this haunting, melancholy novella, Joseph Riippi, eloquently weaves this calamitous story together with a nostalgic, honest voice of an adult and the remembrance of her life at her beach front homes. The memory of childhood is explored throughout the text. “They say it has to do with the way the brain develops, why we can’t remember the earliest bits. 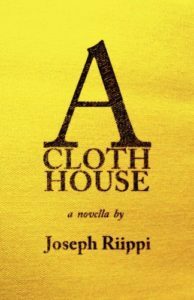 My first memory is naturally of that yellow sheet, feeling its silky fringe and the way it rubbed bunched and clumped in my palm like wet seaweed.” In troubled times, the narrator finds comfort in houses she assembles with this yellow sheet.